The Red Scarab deck shows well-stylized designs of royalty living and ruling their earthly kingdoms. Their human life is signified by red accents-representing the blood of life-against monochromatic color schemes with hints of gold signifying royal status. All Red Scarab cards are set against a white background, representing the sacredness of life on earth. From building colossal pyramids to sculpting masterpiece sphinxes, ancient Egyptians were masters at executing the inconceivable, thanks to their extreme attention to detail. To honor their meticulous methods, the artwork of each Scarab deck pays homage to ancient Egypt's style and class. The artwork of the Red Scarab deck reigns true to the artwork of ancient Egyptian times. Created with well-defined lines and distinct contrast, this deck resembles artwork that could only be created by earthly hands. The Red Scarab showcases a red scarab beetle in the lower right-hand corner of the box. Set against a stark black background, this Scarab is prepared to shine light and luck as soon as you open the box to release the power from within! Much like the yin and the yang, one deck could not exist without the other. Together both Red and Blue Scarab decks complete each other, signifying the cycle of life and infusing immortality in your house of cards. 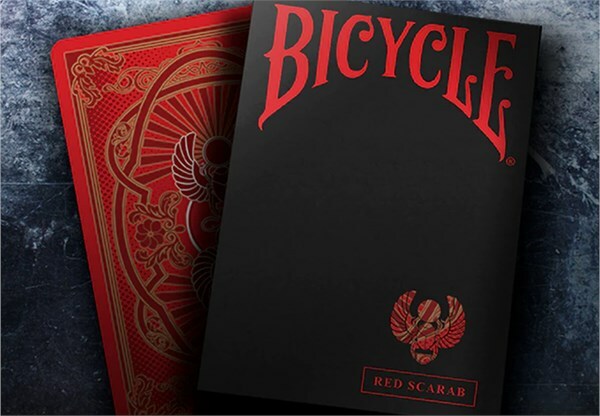 Complete your collection by purchasing the Blue Scarab deck to go with your Red Scarab deck.